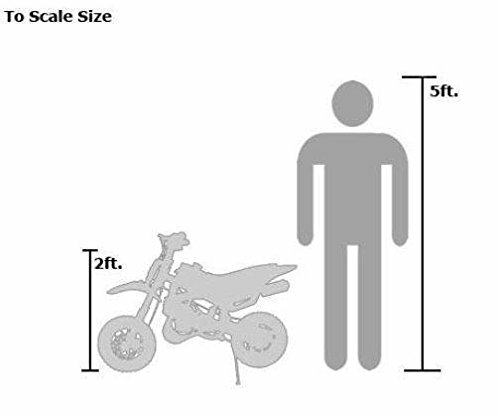 Buying your kid a dirtbike doesn’t mean they’re going to join the 12 ‘o’ clock boys. Motocross is as much an institution of American culture as Football or Nascar.On any given weekend, a trip to the dirt track will see old-timers popping wheelies alongside kids as young as 7 ripping up the turf on 50cc rides. 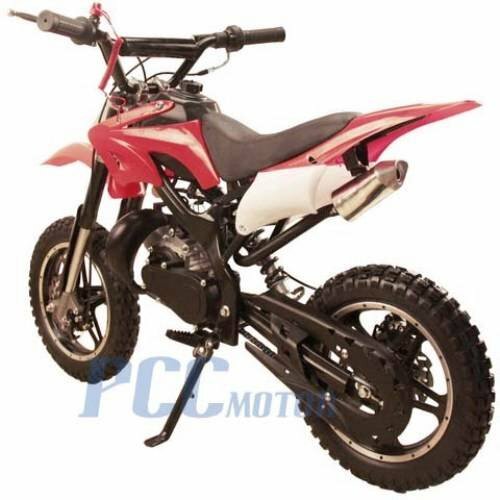 This pocket-bike from PCC has all the look and feel of a full size dirt-bike but the 49cc engine combined with it’s small size make it a great beginner’s option for young riders. The DB50X has been turning heads since its release in 2015. Today, we’re going to find out why. Disclaimer: This bike is not street legal and can only be ridden in designated off-road environments. Children must be accompanied by an adult at all times. Owning this bike requires a professional understanding of mechanics and engineering. A full break-down can be read on the PCC website. 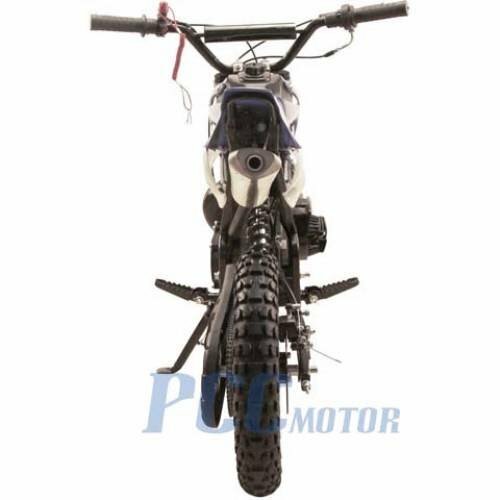 At first glance, the DB50X looks like a full-sized dirt-bike. The light-weight poly-fiber frame is accented by sharp edges and comes in a choice of 5 different colors. Hi-rise mudguards hang above the wheels whilst the engine underneath is easy to access for repairs or upgrades. Set-up is not for the faint-hearted. The bike arrives almost fully constructed although, the front wheel, saddles and handle-bars need to be attached yourself and is easiest with two people. We can’t recommend trying to set this up with no prior knowledge, tools or skills in technical and mechanical procedures. The chain, for example, tends to be a bit tight from the factory setup and should be loosened to avoid damaging yourself or the cycle. The 49cc engine is housed a good 6.5 inches off the ground whilst the 2-stroke design offers excellent torque. It drinks premium unleaded fuel and tops out at 24mph. 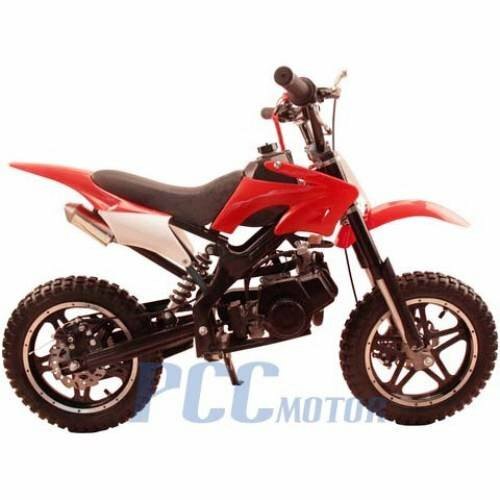 The whole unit stands at around 2-foot tall making it ideal for riders aged 7 and above. The heavy-gripped tires have good traction on tough surfaces whilst front and rear disc-brakes ensure responsive stopping distances. The transmission is automatic which will help kids focus on their balance and handling first before being introduced to tricky gear-changes. The biggest issue we found with this model was the take-off speed. It starts off slow and smooth before kicking in with a sudden burst of acceleration. For that reason, we felt it’s best suited to riders who have some prior experience with dirt-bikes rather than complete beginners; these things can be seriously dangerous without proper supervision. Overall we were impressed with the parts, features and look of this product. It’s a no-name brand which means you’re not going to be paying anything extra for the name on the side. For under $500 it performs well although you will need to make adjustments to really make the most out of your investment. Disc-brakes are sharp and responsive whilst the heavy-gripped high profile tires should perform well off road. We were impressed with the performance, profile and brakes of the DB50X. However, there were some concerns regarding acceleration that mean we can't recommend this for first-timers. So long as you've got a good knowledge of mechanics, and the right tools at your disposal, then this is a great, inexpensive mini-bike for younger riders.